OBSERVER Photo by M.J. Stafford. Fredonia Mayor Athanasia Landis speaks during her State of Fredonia address Wednesday at the 1891 Fredonia Opera House. 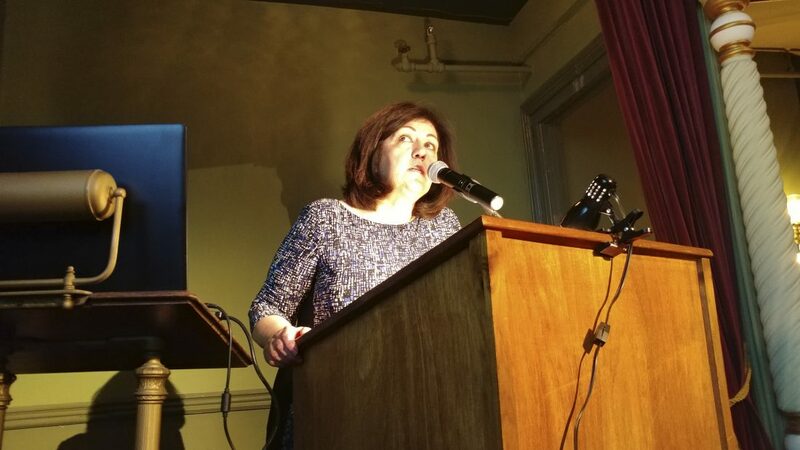 Mayor Athanasia Landis said that early in her State of Fredonia speech Wednesday night at the 1891 Fredonia Opera House, and the rest of her talk was aimed at backing that statement up. Landis, who is up for re-election in the fall, touted millions of dollars worth of completed, ongoing or upcoming community projects. She boasted of advancements in three areas: anchor projects, downtown revitalization projects and infrastructure projects. The mayor said the village still has some pressing needs — chief among them, a new building for the police and fire departments. Landis stressed that most of the cost of the projects is taken care of by state grant money. The total cost of the projects, about $83.7 million, will be handled “without raising taxes a single penny,” she declared. First on Landis’ list of anchors to support the local economy: The planned new Brooks Memorial Hospital on East Main Street. Landis also noted AgriAmerica started a grape processing facility in the former Cliffstar plant on Water Street. She promised that upcoming renovations to the “grand, elegant hall” they were sitting in, the Fredonia Opera House, will include work on doors, windows, seats, the entrance hall, concession stands and a new marquee. The mayor also talked up a project to put studios and lofts in a Main Street building. Finally, she addressed the White Inn, a shuttered Fredonia icon where “people are curious as to what’s going on.” Landis said she and newly hired economic development consultant Nate Aldrich had a tentative plan in place with an interested party to purchase, renovate and reopen the hotel. Barker Common is going to see many improvements this year, Landis asserted. The centerpieces of the park, the two fountains, will get new water flow systems. New benches and lighting will also get installed in the park. Landis mentioned upcoming “streetscape” improvements in the wider downtown area, such as curb and sidewalk work, and the addition of new trees, lighting, bicycle stands and public art. Finally, she noted an initiative for facade improvements on Main Street. The mayor mentioned the reconstruction of Village Hall’s steps and said the emergency waterline replacement project on the north end of Fredonia will be done “within a few weeks.” Upgrades are coming to the wastewater treatment and water filtration plants, and the village has vastly improved its water leak detection. Though the village loses 66 million gallons of water per year, “the good news is, now we know where we’re losing it and we’re taking control of it,” Landis said. 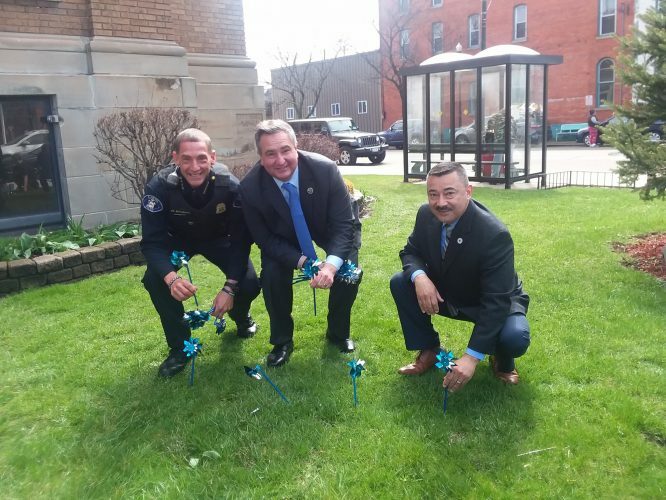 Fredonia’s police station is “old, out of code, small and doesn’t help the officers’ morale in any way,” Landis said. 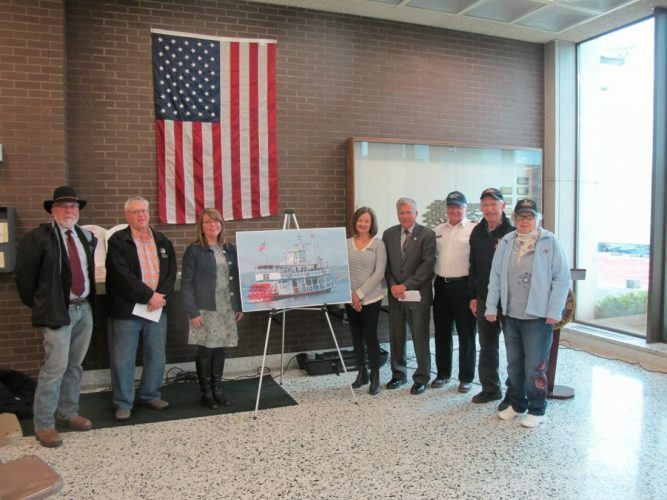 The fire hall needs about $700,000 worth of renovations, she added. 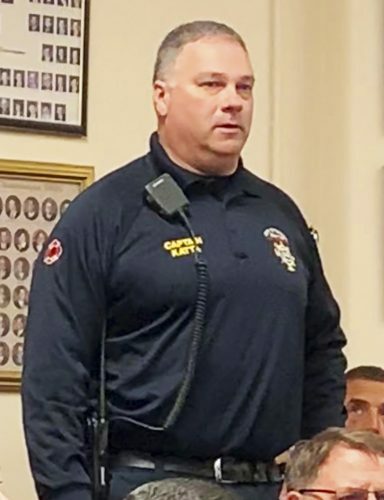 With this in mind, Landis is proposing a new building that will house both the police and fire departments, as well as the village court and the code enforcement department. Although she offered no specifics about such a building, she did offer some ideas for repurposing the departments’ vacated spaces. She said the fire hall could be turned into a brewery, the code enforcement office on the third floor of village hall could get converted into a bistro targeting Opera House patrons, and the police station could become public bathrooms. The mayor concluded a very upbeat speech on more positive notes.